This innovative watering can from ceramicists Jo-Anne and Gerald Warren transforms plant watering from a single gush of water into a gentle spring rain. Instead of a spout, it spreads the water pressure out like a shower head through a number of small holes in its base. Fill the vessel by dipping it into water, keeping the water inside by simply placing your thumb over the top opening. You’ll create a vacuum that holds its contents in place until you’re holding it over your thirsty flowerbed. 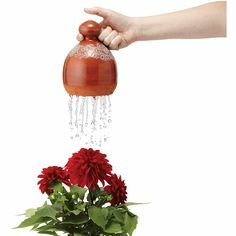 Release your thumb and watch the water sprinkle onto your plants.